About one decade or more ago , the most common sight in homes with babies and toddlers was white cloth nappies hung out to dry in the sun after washing. The same cannot be said today. In fact what now seems to be common is used, disposable baby diapers littered in areas they constitute eye sores. In the Nigerian market today are various brands and qualities of disposable diapers which often leave new parents at loss of which to choose. Several factors such as cost, availability and a baby's sensitivity to a particular product help parents make the final decision on which brand to settle for. This article focuses not on disposable diapers alone but on disposable diapers and reusable ones commonly called 'Cloth nappies' or 'Napkins'. The current economic situation in the country has made the cost of every item in the market to almost triple, cost of diapers inclusive. 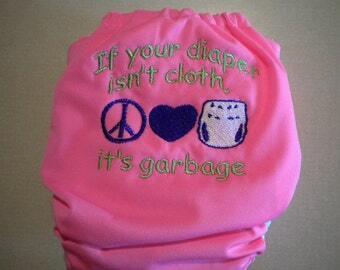 This makes many mothers who hitherto never looked the way of cloth nappies to reconsider their stance. This article that addresses disposable diapers versus cloth nappies in the Nigerian context is therefore very timely and hopefully will help some mothers make informed decisions on which to settle for. Cloth nappies or what is popularly called "napkin" is a reusable form of diaper which like all diapers when used right can prevent the leakage of urine and or feces unto cloths. Unlike disposable diapers, cloth nappies are meant to be washed and reused. They are usually made of 100% cotton or whatever combination of cotton and other materials that produces absorbent materials. They come in different forms, shapes and sizes with the most common form being the square-shaped, white cotton materials which are folded and tied onto a baby's bum backed up by what is commonly referred to as 'napkin pant'. 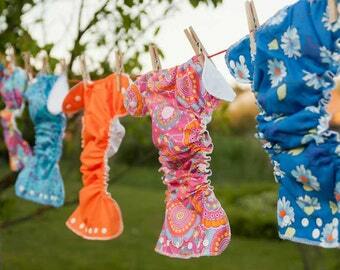 There are also other fancy reusable diapers which come in the shape of disposable diapers. They are usually relatively more expensive than the square-shaped ones and also easier to use. 1. They are relatively cheap compared to disposable diapers. 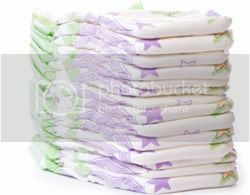 The cost of a large packet/carton of many disposable diaper brands can comfortably buy several packs of cloth nappies in Nigeria and unlike disposable diapers you just need to buy a dozen or more for a baby and you are done. All you then need to do is wash, dry and reuse. Considering the fact that you can use the same nappies for baby after baby makes cloth nappies one of the cheapest and most affordable baby care products in the market. 2. They are environmentally friendly. Considering the Nigerian environment and our very poor refuse disposal system, cloth nappies are the best option. All you need to do is rinse off the urine or poo as the case may be, pour the soiled water into your toilet (which it is assumed every home has at least one) and then proceed to wash the nappies with detergent or soap. Waste disposal is so convenient with cloth nappies. 3. They are reusable. Just like pointed out in 1 above, Mums can use same set of nappies for child after child, replacing only when there is a torn one or when there is need to increase the number available. 4. Cloth nappies are usually made of cotton and therefore highly hypoallergenic; that is they do not contain materials your baby could be allergic to as compared to disposable diapers which usually contain more synthetic materials than one can imagine and therefore increases the possibility of eliciting allergic reactions from babies' skins. (1) Using cloth nappies mean you get to handle a lot of baby poo which I believe few mums love (mums love everything about their babies but they often pass poos that question the "everything" part of the statement). But then you also get to handle poo when using wipes to clean their bums whether you use disposable diapers or not. Whatever type you use, you get to handle poo but to varying extents. Using Cloth nappies often mean you get your two hands deep into poo water. Gross right? (2) If you are not careful, your baby will get rashes. This aspect is easily handled by applying a generous coat of petroleum jelly (Vaseline) on your baby's bum before wearing the nappies. This ensures that urine and feces do not get to cling on your baby's skin as the jelly provides a barrier between the two and therefore ensures your baby has a smooth, rash-free bum. This step is also needed for disposable diapers except for the few brands that come with inbuilt cream. (3) Washing and drying cloth nappies can be such a chore especially during rainy seasons. Many mothers using cloth nappies complain of using up their stock of nappies while waiting for washed ones to dry during rainy seasons when sunshine is a luxury. This definitely does not apply for mums who have washing and drying machines as well as electricity supply when needed. (4) Considering that most cloth nappies in Nigeria are white, you need to be a clean mum to be able to use them well. Discolored and dirty nappies are an eyesore to many. Disposable diapers on the other hand have their own fair share of pros and cons. Apart from the huge convenience of using disposable diapers, many Nigerian mums see their usage as a status symbol and many mums who should rather have used the money for diapers to get something more essential for their babies are often shamed into buying disposable diapers. The commonly seen brands of disposable diapers in Nigeria include Pampers, Huggies, and Molfix. (1) Convenience. This comes tops among the advantages. Disposable diapers are so convenient to use. It barely takes a minute to change from a soiled diaper to a fresh one as compared to most cloth nappies where you get to spread the nappy liner or pant, fold and spread the nappy itself and then get to tie it round your baby's bum. Disposable diaper makers have upped the ante by making diaper pants for that stage of life when babies get wriggly and therefore challenging to stay still for a diaper change. You just need to pull up the pants, check in between their legs and you are done. (2) Minimal handling of baby's waste. With disposable diapers you get to handle or touch very little urine or poo. They make handling babies' waste very easy. (3) Status symbol. This is hardly an advantage but considering the Nigerian culture and society, a mum seen carrying a baby on diapers, more so foreign made ones is viewed either as enlightened, wealthy or someone with good taste. (1) Cost. Disposable diapers are expensive to use, more so considering that each used one is discarded. When you get to calculate the amount of money a baby uses for diapers from birth to toilet-training, one can only scream at the cost. (2) Waste disposal. We have a horrible waste disposal system here. Many owners of farmlands often complain of finding heaps of used diapers in their farmlands and these are not easily biodegradable. Diapers are said to rank second after waterproof bags in littering the Nigerian environment. Many mums have complained of not knowing how to dispose of used diapers from their home. 'Oyibo' that introduced diapers to Nigeria have an almost perfect waste disposal system where wastes are sorted into different containers based on their biodegradability. When we copy things, we are supposed to copy the entire package and not just a section especially when it leaves us worse off than when we started. (3)Materials used. Disposable diapers are made with diverse synthetic materials which often raise safety concerns. Some of the materials are even rumored to be toxic and/or raise one's chances of getting certain types of cancers.